I don’t know who originally came up with the idea of shrimp and grits for breakfast, but I think it may be one of the most beautiful things you can look forward to in the morning. There is something familiar about the texture of the grits, even to people who aren’t used to eating grits for breakfast. For me, it brings me back to the days in my childhood where my mum would go through the extra effort of making cream of wheat for me before school. Those mornings always seemed so warm and comforting, even if it was an ice storm outside. The savory grits in this dish, studded with bacon crumbles, take comfort to another level. As far as the shrimp component is concerned, I have to think that it was just a matter of what some southern American cook had on hand. Sure, we eat pork and corned beef for breakfast all the time, but why not seafood? It is kind of about honing your understanding of food origins, and thinking about cooking regionally. If inland cooks are serving grits with fresh eggs from their chickens and cured bacon from their smokehouses, why wouldn’t low-country cooks serve them with some fresh-caught shrimp? It is our luck now that these recipes have been distributed so widely, for we have the opportunity to gain the knowledge of cooks from everywhere, and from almost every time (I guess it would be culinary anthropology). In other words, they did a lot of work in developing recipes, and now we can just enjoy making them. That said, I am not a huge fan of writing recipes, but I do it when I feel it is warranted. I am not sure, in this case. What I bring to this dish is nothing more than a few extra flavorful touches, including bacon in the grits and a good, healthy dose of Old Bay seasoning on the shrimp, which are just sauteed quickly in some olive oil, butter, and garlic and tossed with some freshly chopped parsley at the end. In the recipe shown in the picture, I left the shrimp shells on, but I highly suggest removing them, as they make for a mess when you eat them. However, the shells do retain a lot of the seasoning, so if you are making this dish for only yourself or some people who’ll not mind sticky, gritsy fingers, go for it. If readers are interested in more details about how to make this dish, I’ll be happy to post an official recipe. Just let me know! WOW! What a great response! Here’s the recipe, kids! If you have questions, let me know. This dish is quite simply marvelously delish. I made it a few weeks ago, my husband, a skeptic at first (no southern roots) devoured it. He said it was really tasty. I added a little cayenne and some red pepper flakes, you know a little heat. I will definately be making this dish again. Another tasty treat, Fish and grits yum! Shrimp and Grits is one of my most favorite foods to eat and I am not even a southerner. yum. yum. I haven’t had shrimp and grits since I’ve came to college. This posting has definetly made me purchase a round-trip ticket home. I love Shrimp & Grits for breakfast!!! 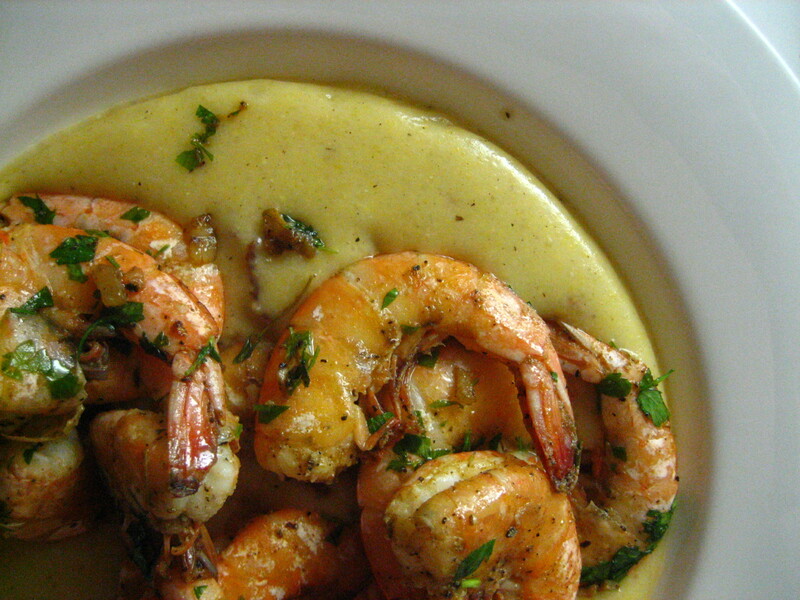 yum…always up for a good shrimp & grits recipe…please do post! I’m totally down for the recipe so post away. I believe I may cook some Shrimp and Grits next weekend for breakfast! It sounds great! wow, that looks really good.. lol im hungry now. I love shrimp and grits but never thought about doing it for breakfast! Love shrimp and grits any time…. we add some pepper jack cheese to ours! Hey, Tony – let me know if the recipe de-mystifies grits. It is one of the simplest, most delicious foods I can imagine. Would love to have your feedback. Indeed, breakfast food why not seafood? My children watched Ratatouille and the children started mixing different flavors after the charactor in the movie experimented with sweet and salty items. By the way, I saw your note in ‘who’s fig’ and you looking for a community garden. Since my family and I don’t have access to a community garden we seek out sources for organic food. I even wrote about different options on how to get organics inexpensively as part of an ebook I wrote. Important when there are no markets or gardens close by. Here is the link about the book if you want to see what else is inside. Drool. Soon as I saw the title I thought breakfast. wow it looks so yammy! i’d reallly like the shrimp and grits receipe because i live part time in NO where the shrimp are plentiful, delicious, and FRESH!!!! and reasonable…. may I have a share? yes, would love the recipe! Had a wonderful dish of shrimp & grits in Birmingham, AL, in October, still craving more .. I think I was in Charleston, SC the last time I had Shrimp & Grits, although it was for lunch, and not breakfast. There wouldn’t be a “dime of difference” if you said you were having Shrimp & Polenta, and you could probably use the same picture to illustrate it. However, if you cook some more of the liquid out of those grits, and then fry it up to make a cake… and put a little alligator sausage with those shrimp….mmmmm, you could have one for breakfast and the other for dinner. Bill, you are so right about this being a dish for any time of day…morning, noon or night! Alligator sausage would be very welcome addition! My mother’s family, from the sea islands near Charleston, has eaten shrimp & grits from time immemorial, most likely because the two main ingredients, fresh shrimp and corn, were cheap and readily available. Her particular variation, which she got from her mother, involves mixing cream cheese and Gorgonzola cheese with the grits. It is so good that it has become our traditional Christmas Day dinner on that side of the family. Wow! What a rich version of the grits – will have to give that a go! I’d post the recipe, but it’s entirely in her head and doesn’t make much use of measurin’ utensils. Definitely share the recipe, my husband will be so excited to know I know how to make it. He’s from the South (Mississippi) and would be thrilled to see me making something besides baked chicken! I hope you do, Lakia! You’ll not be sorry…just be patient with the grits and trust your gut with the shrimp seasoning. Growing up on the coast down South I am very familiar with shrimp and grits. It’s not for just breakfast, it always made for a great lunch or dinner. I remember camping out on one the small islands around after a long day catching shrimp. Nothing is better than fresh shrimp and grits made over a campfire on the beach. Thanks, Anita! Glad to be a part of your blog-hop! Our local gourmet sit-down restaurant, lugos, serves shrimp and grits as part of their cuisine. I love them! Swing by and leave a comment if you can! Thanks! I lived in Huston, Tx for 13 years and ate something like this all the time, however, I had it for dinner or lunch. I am from Oregon and there is a West Coast breakfast many have not heard of: “Hangtown Fry”. It is basically scrambled eggs, with peppers, onions, bacon, and fried oysters. If you want, I’ll share the recipe and history. The Hangtown fry is great with some hot sauce on it. I agree…Shrimp & Grits is a great way to start the day…or for any meal! I’m director of personal enrichment cooking school (www.700kitchen.com) here in Savannah, GA. Shrimp in Red Eye Gravy over Creamy Grits is the main course of my class focused on Low Country Cuisine (our regional cuisine). Based on the research I’ve done it is said to have originated as a breakfast for Low Country fishermen. Certainly they would have had access to shrimp easily enough and grits would be inexpensive, hearty, and filling before a long day of fishing! What a treat! I come from Japan where we often ate broiled fish with rice and raw egg on the side so prawns for breakfast isnt anything too far off the norm for me but WHERE do I find grits in the S of France??? I live in Provence where Gambas Provençale would certainly not be served next to croissants but I’m sure my friends would love it – as long as they wont be kissing anyone afterwards 🙂 Thanks fignasius! Shrimp and grits is indeed the South Carolina lowcountry legacy. There would always be a pot of grits simmering on the stove, all day long, so naturally when the shrimp came out of creek…. Gorgeous and delicious looking blog!